In a large project like this one, you will need to add thread many times. When your thread gets down to about 6″ (to estimate it, think of the length of a dollar bill), remove the needle and cut a new length of thread. Tie a slip knot in one end of the new thread, make the loop small and leave at least a 6″ tail. Thread the old thread through the loop in the slip knot, placing the loop next to the bead, and tighten the slip knot around the old thread. You should hear and/or feel a distinct snap as the knot tightens. Tug on the threads to test the knot and make sure it holds. Thread a needle on the new thread and continue stitching. After you have added several rows of stitching, or at the end of your project, make sure to weave in the two tails to secure. Thread the needle onto the new thread and stitch through beads near where you left off. Make sure to stitch through each bead in your path – if you skip a bead, thread will show. End with the new thread exiting the same bead as your old thread. Continue stitching with the new thread. Weave in the tail of the old thread as above. You do not need to weave in a lot of thread, just enough to make it secure so it won’t slip or work its way out. Remove the needle from the old thread and cut a piece of new thread. Using a lighter or match, carefully poke the end of the old thread into the flame until it forms a tiny ball. Repeat with one end of the new thread. Tie the old and new threads together using a square knot. Pull on both threads so the balled ends are pulled toward the knot. The knot will tighten, but won’t come out with the balled ends holding it in place. 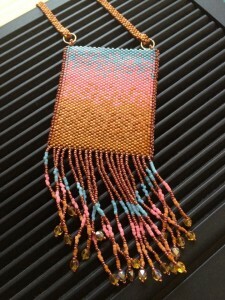 Continue stitching, pulling the knot through the beads. 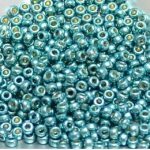 If you are using smaller beads like 15s, you may need to practice making tiniest balls that will hold. This technique is why I love Fireline!